Bengaluru: With the recent clarification issued by the Ministry of Health. indicating its decision to impart equivalence to DNB degrees which are imparted DNB done at hospitals with more than 500 beds, the largest Association of DNB Institutions-ANBAI recently asked the Medical Council of India President to also implement the same in the current scenario as soon as possible. Demanding that the decision of the Ministry should be brought in as soon as possible, ANBAI has now asked MCI president to ensure implementation of the Ministry of Health decision. The issue was brought forward by ANBAI President, Dr Alex Thomas during a recent event held in Bengaluru. 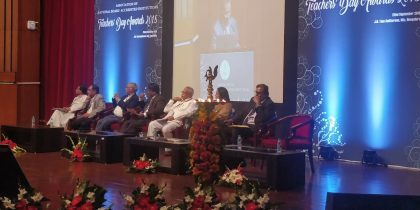 The event participation distinguished guests including Dr. Jayshree Mehta (President- Medical Council of India), Dr. Abhijat sheth (President-NBE) and Dr. Rashmikant Dave (Executive Director-NBE), Dr. Alexander Thomas (President-ANBAI), Dr. S Rajasekaran (President Elect-ANBAI). At the event ANBAI along with the National Board of Examination (NBE) honoured eminent and distinguished Medical Teachers and Hospitals (2018) who have contributed immensely towards towards the cause of furthering Medical Education in our country. The awards were conferred by Shri Vajubhai Vala, Honorable Governor of Karnataka. ” Ministry of Health and Family Welfare has made clear its intentions. We have now requested the MCI President to also bring the same into implementation for the benefit of DNB candidates across the country,” Dr Alex Thomas, President ANBAI told Medical Dialogues. Sure MS/MD is not equivalent to DNB, want a proof, give your MD/MS final exam in an institute from another state, not in the hospital where you have done residency. You\’ll know the true meaning of Post graduation exam. Good evening to all the doctors. First of all change the name DNB to MD/MS. After changing the name the equivalence automatically will come to everybody. Every doctor will be treated equally. The best and the easiest thing would be to ask MCI to rename DNB as MD. The problem of Equivalence will then automatically Vanish. Already the govt.is in the process of increasing MD seats by leaps and bounds. So, in one stroke Govt can create so many seats. Universities are now not required to impart Education. It is the Coaching institutes which impart the REAL Education. Hurray! God Save us from these Thinkers.